If you’re considering pilot training and you’ve begun your research, you’ll know that training to become a pilot doesn’t come cheap. 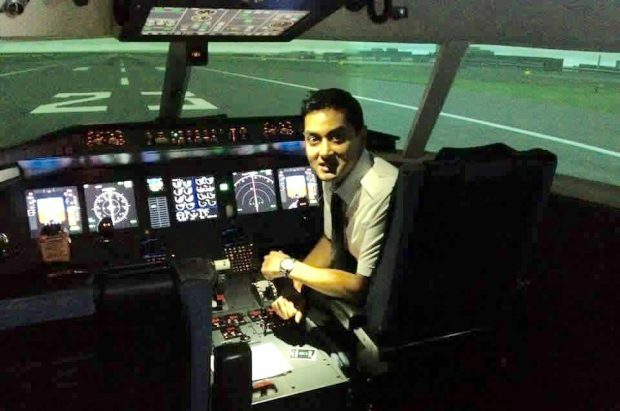 However one pilot, Si Sarkar, has gone from his first flying lesson to a pilot job with Thomas Cook – all for £37,000. The cost of Si’s training is already remarkable, considering that integrated courses in the UK can often have a price tag upwards of £90,000. However, Si also pushed himself in other ways, completing his ATPL theory training within 12 months, when integrated providers quoted a minimum timescale of 18 months. At the age of 29, Si decided to have a complete career change from running his own business working as a Business Consultant to training to become a commercial airline pilot. He explained that he chose the modular training route because he wanted to complete his training in the shortest possible time and, as he was self-funding, it was also important to choose a cost-effective route. He enrolled with Bristol Groundschool, passing all his ATPL theory exams first time and completed his practical flight training with Wings Alliance member, Bartolini Air. “Training with Wings Alliance schools cost me only £37,000 from my first flight to a job with Thomas Cook!” said Si. “This Alliance is providing a really credible and cost-effective route to airline placement for modular students.” Si has been offered a job flying with Thomas Cook, starting in November 2016, while other graduates from the Wings Alliance have secured jobs with airlines including Flybe, Thomas Cook and Stobart. As for what Si thinks of the Wings Alliance model, he explained, “It opens a new door for modular pilots. The most frustrating thing is you get your licence and all job applications are linked to the big integrated schools which makes it hard for modular students. Now there is a viable alternative route with really credible schools behind it. “As a result of passing the APC course, the Wings Alliance put me forward for an interview with Thomas Cook’s partner, IAGO. I received confirmation that I had passed their Selection and Sim Assessment and I started the following week! I am still coming to terms with this – it just doesn’t seem real or it’s just not quite sunk in yet! This past four weeks since being put forward to the airline by the Wings Alliance have been one very fast roller-coaster. My first airline interview and I got in and what an airline to get into!